Las Vegas, NV, 15 April 2013 – UK local TV took a major step forward today as Comux UK, the company responsible for operating the UK’s local TV infrastructure, signed its first technology vendor at NAB Show 2013. Comux UK has selected UK partner Techex to provide Nevion’s pioneering service information technology, SI Manager, which will enable local TV stations using the Comux infrastructure to integrate with the UK’s DTT service Freeview and to cross-carry service information and EPG data. Announcing the deal today at NAB Show 2013 in Las Vegas, Ed Hall, Comux UK’s Chief Executive said that the partnership is a highly important landmark in the development of UK local TV. “The next few months are going to be some of the most exciting in the history of British television,” said Hall. “At the end of the month, the second round of local TV licensees will submit their expressions of interest to the media regulator Ofcom, while the first local launches could go live by the end of the year. From today, Comux has started building the broadcast infrastructure that will support local TV service across the UK. Nevion’s technology is the first piece of the jigsaw and a vital one. 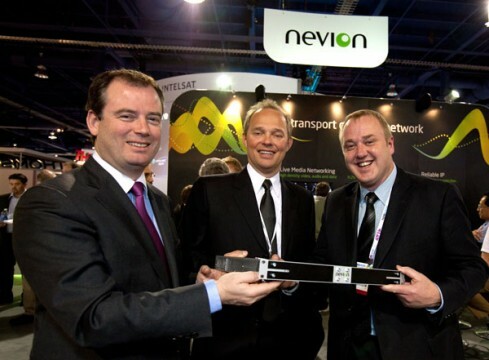 “The Nevion SI Manager is an incredibly important part of the infrastructure: not only is it the last device in the technology chain before transmission, but the quality of the service information and EPG data relies entirely upon it. It’s vital that local TV delivers as good a user experience as national broadcasting, so it was important that we have the same quality of technology as the national multiplexes,” he said. Nevion SI Manager is the standard technology for every UK multiplex that integrates with Freeview and has been specifically designed to provide regional adaptation of DTT services in the UK. A major advantage of the technology is its unique ability to remove expired event data and to insert service information in any packet position, thus optimising scarce bandwidth resources while ensuring that viewers have reliable and up-to-date programme information.